When I started thinking about the additional flower-wear for family and special guests, I figured I’d ask Mama Leadfoot’s preference on lapel vs wrist corsages and go from there. Silly Miss Road Trip for thinking it would be a simple question! At first she wanted lapel but then she worried about getting too hot over the course of the day and taking off the little jacket that goes with her dress so switched to wanting a wrist corsage after all. Of course, if she’s taking off a jacket, whatever’s on her wrist could still get in the way or prove cumbersome, so what to do? Convertible corsages it is! This way I get to make everything the same and the wearer can decide how she wants to deal with it, there’s no words exchanged over who gets what or making twice what’s necessary to make sure everyone’s happy. 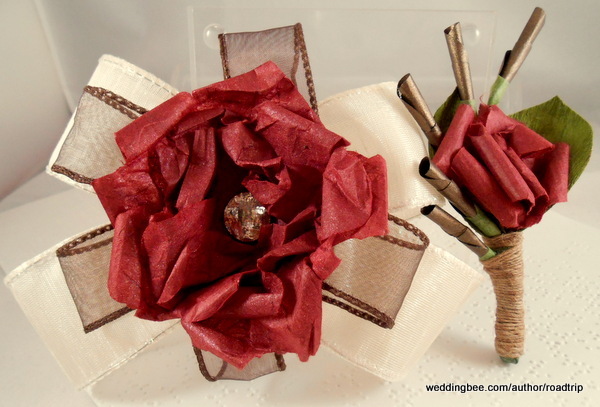 All it took was adding a little clip to the back of the corsage and sewing a bit of elastic to some ribbon to form bracelets that were neither too stretchy nor too tight. The best combo for me ended up being 6″ of grosgrain ribbon and 4 inches of elastic, but it definitely depends on how much stretch your elastic has as to whether or not that ratio needs to change. Sewing the ends of each piece to their match and then rolling the seamed bits into themselves (followed by a few more stitches to secure) ensures all ends are enclosed and your edges are nice and neat. For the corsages themselves, I went pretty simple with a 2-layer bow and a paper flower with a flat-backed crystal in the center. 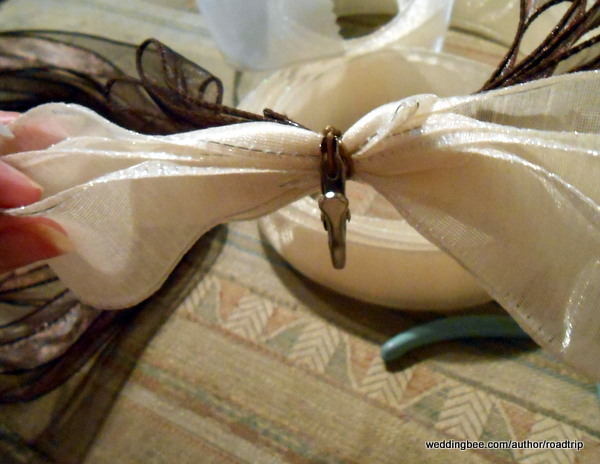 The bows are made out of 28″ pieces of wired ribbon: 4 loops for the wider, cream ribbon and 5 for the skinnier, chocolate ribbon. While the loops are still flat I secured the centers with a piece of plastic-coated wire and used the ends of that wire to secure the little clip to the back. 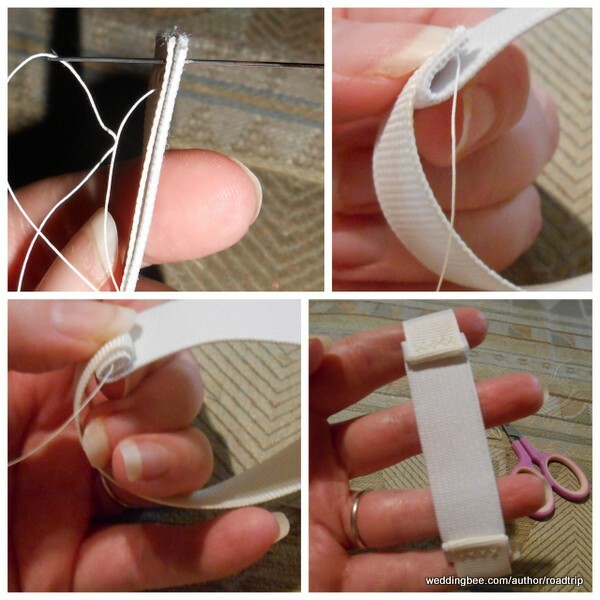 Fluff out the bow loops and then glue on your center items and the clip will be all-but hidden. I’ll include a package of corsage pins with the corsages, but the clips can also be used to attach to clothing or straps on their own. For the gentleman in the family I just went simple with a paper flower and a spray created out of tubes of bronze paper and wire, wrapped with floral tape to secure them and attach groups of five together. A couple of crepe paper leaves and I thought I was done, but the stems looked so unfinished. I tried a couple of different ribbons but they didn’t really look right, until I remembered some hemp yarn I had in my knitting bag. The residual tackiness of the floral tape actually helped quite a lot to keep the yarn wraps in place, but I found the best way was to start with a slip knot at the base of the stem, tightened to secure, and then wrapping up, enclosing the “tail” as you go. This mean I only had to use a little bit of glue at the top edge to make sure nothing came loose. I think the real lesson, here, is not to give people options so as not to make more work for yourself. But necessity is the mother of invention and all that, so I think I hit on the best compromise overall.